Thursday, August 9, 2012. My day was supposed to happen like this: Wake up at 6:30am after going to bed early so I am decently rested. Shower, dress, and leave the house at 7:30am and arrive in Bristol, Rhode Island at 8:45am. Kill time in the Roger Williams Law School library reading up on the “excited utterance exception” to hearsay while my boyfriend attends a continuing legal education class. Then go to Newport, Rhode Island to enjoy a delicious lunch and an afternoon photography stroll. Instead, my day happened like this: Wake up at 6:30am after being unable to fall asleep until 2am, so I am very tired. Shower, dress, and leave the house at 7:30am and arrive in Bristol, Rhode Island at 8:45am. Realize that I am sick. Rather than reading in the law library, spend two hours on the phone with my doctor’s office, my mother, and various pharmacies trying to address the issue when I am in Bristol, RI and my doctor’s office is in Bedford, MA. Spend an hour and a half in a walk-in clinic in Bristol. Decide that I am exhausted and in too much pain to go to all the way to Newport for lunch. Instead, swing by the Beehive Cafe in Bristol…and have a wonderful meal. Decide that it’s a pretty good day after all. My first impression of the Beehive Cafe was that it was cute name for a cute cafe, and fitting: There is a lot of hard work going on inside a very small space. Located down a side street (Franklin Street) close to Bristol’s scenic waterfront, it definitely has that authentic summer ambiance. You order at the counter just inside the door, then you select a table. There are a couple tables on the ground floor near the counter, but that area feels more like an entryway and maybe somewhat cramped. I personally would prefer one of the tables either (1) outside the door, on the patio, (2) upstairs on the second floor, or (3) upstairs on the outdoor deck. The cafe staff will bring your order to your table. As I stood in line deciding what to order, I was so excited to see the Beehive Cafe’s breakfast menu! Did I mention that they serve breakfast all the way until 3:30pm? What an excellent decision. There are few things that frustrate me as much as seeing “morning only” time restrictions on such wonderful food as breakfast. Most of the options on the lunch menu are in the $8 to $12 range, while most breakfast options are in the $6 to $10 range. Despite my initial inclination to try the french toast I eventually went with one of the specials written on the blackboard: cornbread hash with roasted red peppers, goat cheese, and basil, accompanied by two eggs any style (over easy) and toast (white bread). My boyfriend ordered a plain hamburger, just the patty and potato bun. For drinks, I had a delightful housemade concoction of green tea and just a touch of lime. My boyfriend got an Empire “Real Cola” soda, made with cane sugar and bottled in that very same town of Bristol, RI. Some restaurants will give you a number or a flag to set on your table so the waitstaff will know where to deliver your food. Rather than give us a number or a flag, we were handed a tiny model of a panda bear. (It’s the little things in life, right?) We then selected a table upstairs near the stairs. The air conditioning wasn’t turned on which is usually a source of frustration on a hot day (85+ degrees) for a temperature-sensitive person like myself, but the fans were on and I was actually very comfortable. I was excited when our orders arrived. I cannot remember the last time I had any kind of breakfast hash. I thought about how much my palate had expanded over the last couple years. Not long ago I would have refused to eat hash, even despite my love of goat cheese, because I wouldn’t eat peppers. This afternoon as I devoured the hash, eggs, and toast, I felt exquisitely glad those days were behind me. Cornbread hash with roasted red peppers, goat cheese, and basil, with two over-easy eggs and white toast. My boyfriend enjoyed his plain hamburger and cola while we argued the merits of ordering just a patty and bun versus a hamburger or cheeseburger with “extras” on it (lettuce, tomato, bacon, special sauce, etc.). He said the patty and bun on a genuinely good burger should be good enough to stand on their own without any extras. I see his logic, but I enjoy the extras because I feel they add space for a cook to get creative. Creativity often rewards. But debate aside, he was happy with his hamburger. 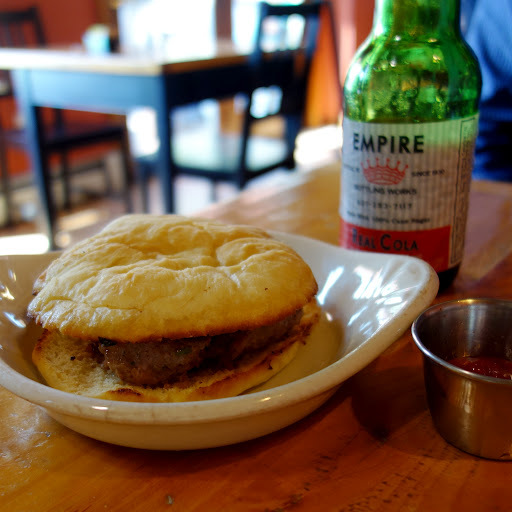 Plain hamburger on a potato roll with an Empire “Real Cola” soda. 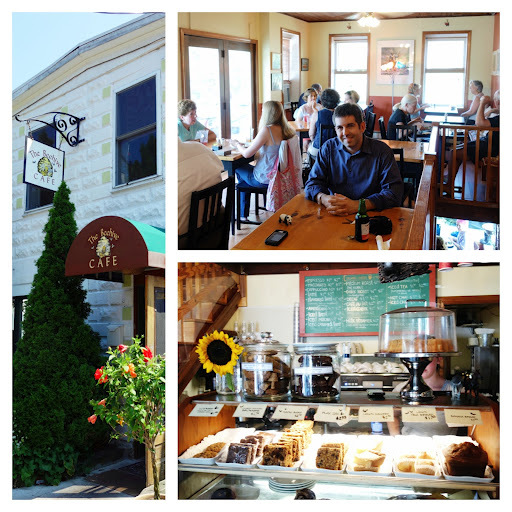 My experience at the Beehive Cafe transformed what was developing as a miserable day into a pretty good one. I would definitely return the next time I find myself in Bristol, Rhode Island. As a bonus note, there is an ice-cream shop just around the corner from the Beehive that I didn’t try but my boyfriend says is pretty good. Maybe I’ll return soon! 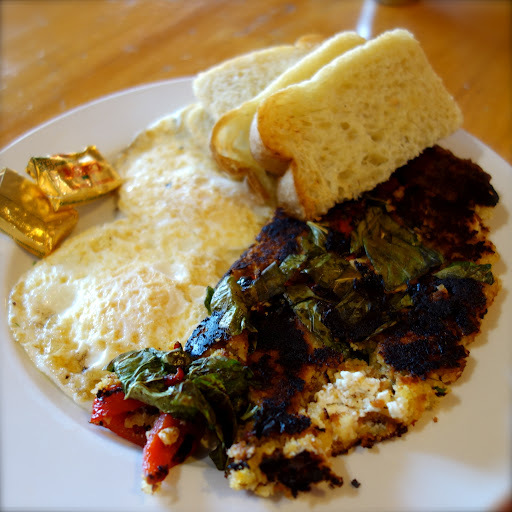 Hash has always been one of my favorite things to eat for breakfast — that looks like a really interesting one! It was! I wouldn't have thought to put goat cheese and roasted red peppers in a breakfast hash, but the Beehive Cafe pulled it off. You're boyfriend is in the right. A good burger should be able to be eaten without any extras. I apply that philosophy to all of my food. Creativity is all and well is the food is good, but it can distract the chef from actually focusing on the meat (or whatever he is cooking) or make him think that he can cover up the bad with creativity, spices, and garnish. The only in its truest form can a meal be judged. Sounds like a great place and I love your photos.